SEE BLOG POSTING FOR UPDATE –RAISES, RAISES AND MORE RAISES! When Measure B was passed, the SUSD teachers were in the 96th percentile of teacher compensation according to pay scales and insurance benefits reported by the State for 2010-2011. On January 6, 2014, the State released the 2012-2013 pay scales. 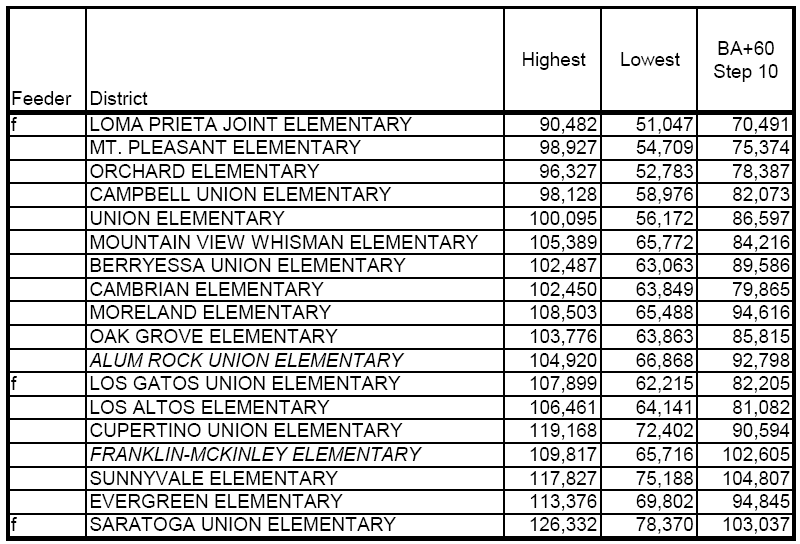 Now the SUSD teachers are in the 99.73 percentile. This chart shows teacher compensation compared to inflation. 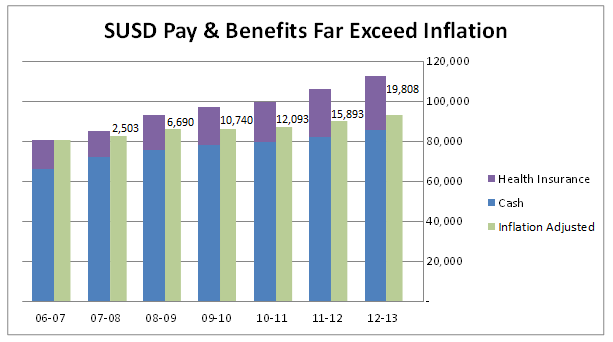 The blue/purple bar is SUSD compensation, the green bar is 06-07 compensation indexed for inflation. The numbers by the bars are the amount by which compensation has exceeded inflation. 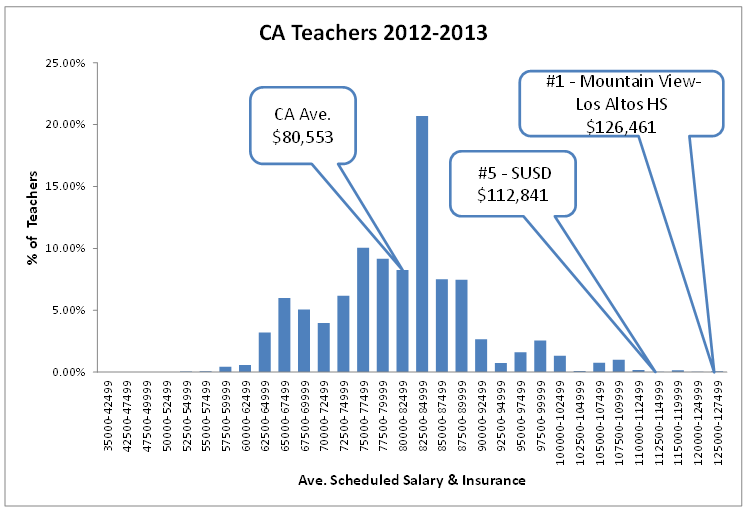 During this period, teacher compensation has outpaced inflation by $19,808. The SUSD teachers have climbed ahead of the LGSUHSD district teachers to become the 5th highest paid teachers in the State. 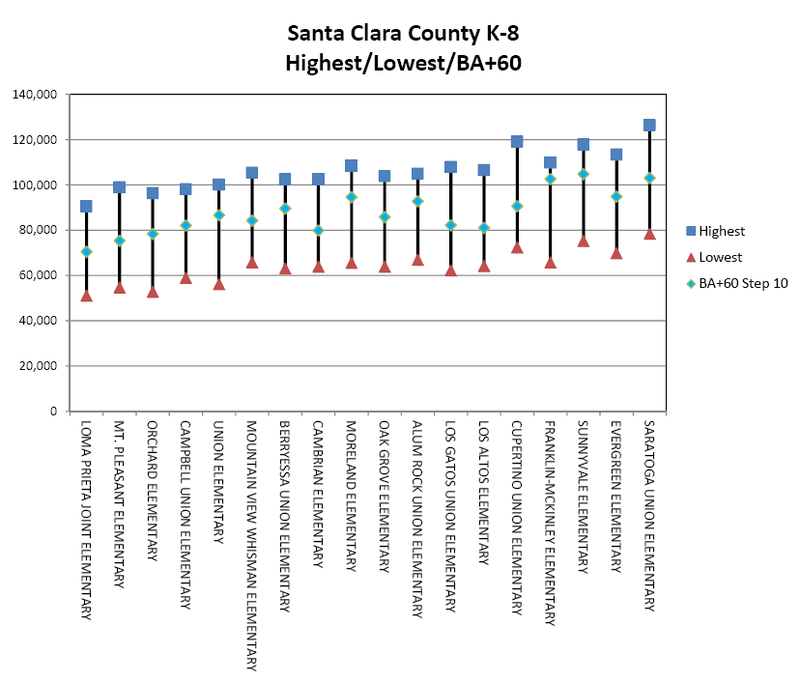 This chart shows the compensation for the elementary districts in Santa Clara County using the “Average Scheduled Salary Paid.” See below for definitions. “f” designates the LGSUHSD feeder schools. The Lakeside Joint Elementary District, the fourth feeder school, did not report its compensation to the State. This chart was recently updated to include the insurance benefits of the two italicized districts. These districts reported $0 in the State summary reports but reported values in the detailed benefits reports. The State also reports the lowest and highest salaries offered and the salary at a standardized education/seniority ranking of BA+60, Step 10. This table compares the lowest, highest and standardized salary plus insurance benefits of SUSD to the other K-8 districts in the county. This is the same information presented graphically. At each level of comparison SUSD is either the highest or among the highest. Given the ranking of SUSD’s compensation, reasonable recruiting and retention practices do not justify increasing the compensation of these instructors. It is highly imprudent for the district to use reserves to fund pay increases for teachers who are already highly compensated. Rainy day funds should be reserved for bad times. The foregoing is derived from the State’s reported data. The salary data represent scheduled salaries only and exclude salaries for summer school, bonuses for special accomplishments or payment for extra-curricular services such as coaching, drama, or music. Bonuses for master’s or doctorate degrees are included by some districts and not others. The value for insurance benefits reported here is the maximum benefit for which the district is liable. In the case of the two italicized districts, the maximum benefit is estimated from the detailed reports. These data make no provision for pension contributions, unfunded pension liability or unfunded non-pension retirement benefits.